AS PLANNING SAGAS tend to do in Ireland, Apple’s battle to build a data centre in Athenry is dragging on and on. At the start of 2015, the US tech giant applied for permission to build a large data centre in a forest near the Galway town. Almost three years on and a final decision on planning is still pending. It looks like Apple might be finally getting fed up. Yesterday the Bloomberg news agency reported that the company has warned Irish officials that the lengthy delays could jeopardise the future of the project. Speaking to TheJournal.ie today, East Galway TD Seán Canney said reports questioning Apple’s commitment to Athenry are incorrect. He said he spoke to Leo Varadkar this morning, noting the Taoiseach confirmed he was in contact with Apple executives last week. “They confirmed to him that they are still committed to the project in Athenry. Apple have expressed their concerns in the delays which is understandable, but the bottom line is Apple are still committed to the project in Athenry. “I will continue to work with the people of Athenry and all the State agencies and the Taoiseach to ensure delivery of this project,” Canney said. So why has one of the biggest companies in the world struggled so much to get what should be a fairly straightforward project over the line? Here’s a quick rundown of what’s happened so far. Apple announces it will apply for planning permission from Galway County Council to build a data centre on a greenfield site in Derrydonnell, near Athenry. It is estimated that it would cost €850 million to develop the site, and between 100 and 150 people would work at the centre upon its completion. The site covers a space the size of about 23 soccer fields. It would be the single biggest private sector investment in Connacht, and was welcomed by many locals. At the same time, plans for a similar facility in Denmark were revealed. It was intended that both would be operational by 2017. Galway County Council says it needs more detail from Apple about its plans. It was intended that the centre would be completely powered by renewable energy. The council was concerned about how this would work. Galway County Council grants planning permission for the data centre. Almost immediately objections are lodged with An Bord Pleanála by eight objectors. Most complain about the negative environmental impact the data centre could have. After requesting more information on the issue, An Bord Pleanála holds an oral hearing to hear all arguments for and against the data centre. An Bord Pleanála grants Apple planning permission to build the data centre. In response to environmental concerns, the body said that the facility ”would not seriously injure the amenities of the area or of property in the vicinity”. Three people apply for a judicial review of An Bord Pleanála’s decision on environmental grounds, saying the data centre could destroy the local forest. These are local residents Allan Daly and Sinéad Fitzpatrick and Wicklow resident and landowner Brian McDonagh. 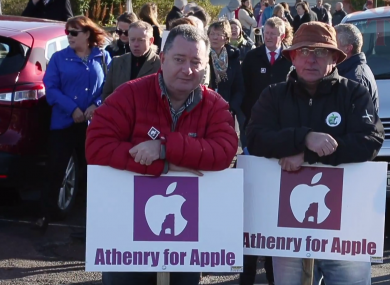 Residents in Athenry, most of whom are in favour of the proposal, demonstrate in favour of Apple. More than 2,000 people attend a rally in support of the plan to build a data centre near the town, which has a total population of about 4,000 residents. Brian McDonagh’s objections are dismissed, however Allan Daly and Sinéad Fitzpatrick’s applications for a judicial review are successful. The case is fast-tracked and is due to be heard in the Commercial Court in March. After Justice Paul McDermott reserved his judgment in March, it was anticipated that a final decision would be made on the project near the end of June. This is delayed again, and a ruling is expected at the end of July. In the meantime, Apple announces it is building a second data centre in Denmark. This followed its completion of its first data centre in the country, plans for which were announced on the same day as the centre in Galway. The decision is postponed again, and is now scheduled to be heard on 12 October when it is expected that a final judgement will be delivered. Email “Why Apple has been stuck in a three-year battle over its Athenry data centre”. Feedback on “Why Apple has been stuck in a three-year battle over its Athenry data centre”.